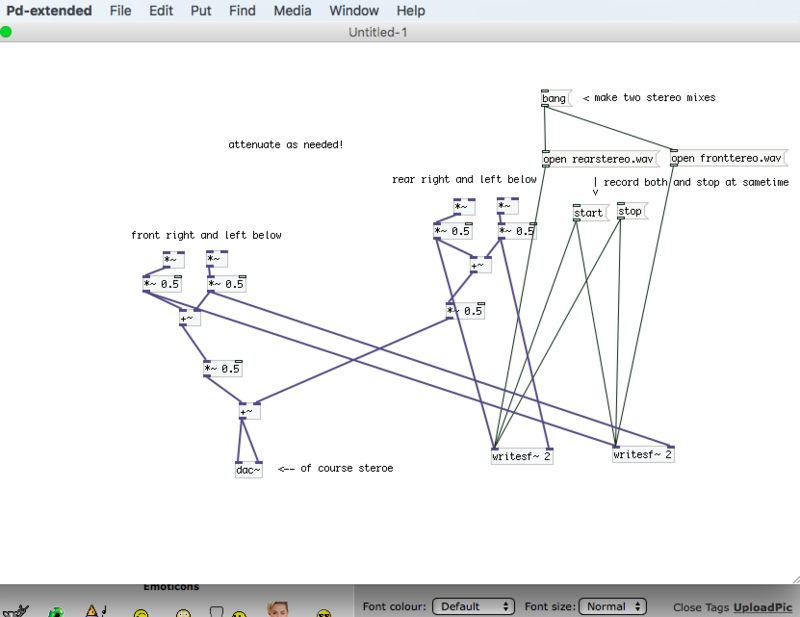 MUFF WIGGLER :: View topic - quadraphonic wav files player ? quadraphonic wav files player ? OR would anyone be able to make one without me having to sell a kidney ? if you have a quad or 5.1 setup, most media players should playback quad wav files. What you want is the SparkFun Tsunami. It is an $80 PCB that plays up to 8 channels of CD quality Wav files off of a microSD card. It is Polyphonic (can play over 12 "tracks" at a time (that is 12 sets of up to 8 channels). 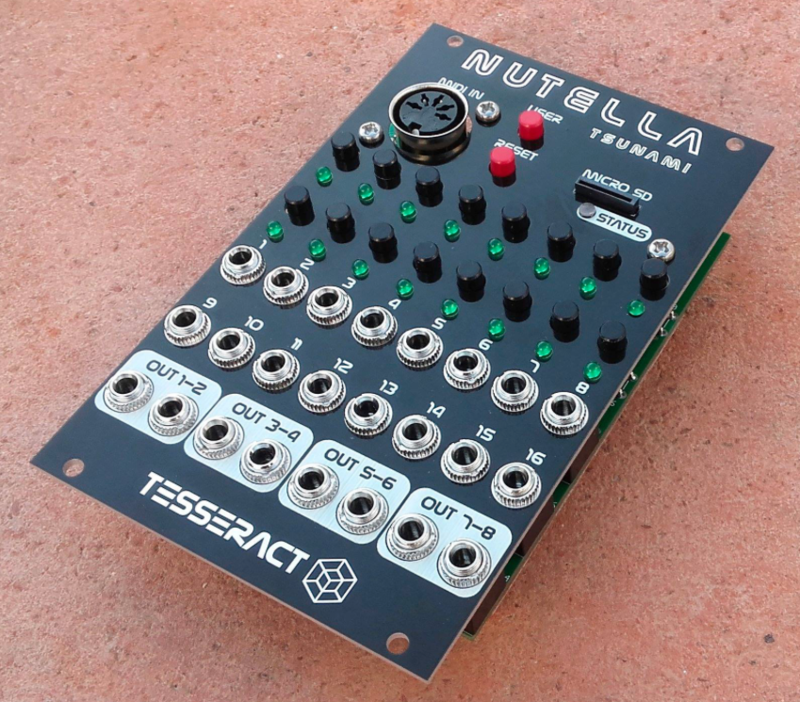 I just got the Tesseract Nutella Tsunami module (you provide the Tsunami PCB) and it works great. Basically you can program the 8-outs yo be mono or grouped in and config you want (5.1, 7.1, 4 stereo pairs, etc) all programed into a .ini file on the card so each card can have it's own configuration. You trigger via gates, front panel momentary push buttons, or MIDI. Files can be played one-shot, only when gate is high, continuously looping and more. All programmed via the .ini file. The inputs can also be programed to be next file, volume, and other functions. Which the Nutella/Tsunami you can have 2 different quad mixes playing at once and also have as many as will fit on the card queued up and ready. Track length is all on card size. what do you measn exactly by quad set up ? I only do have a multichannel soundcard .. when opening quad files in Audacity it opens a 4 channel mixer but the output is stereo and it does not seem to have mutlichannel outputs options. Same VLC just plays back the wav in stereo and does not seem to have surround options .. ? The main problem with Quad content distributed as a product for others to play on their home systems (unlike live quad) is that there are very limited number of people with a true quad system. Surround Sound is not Quad. The rear speakers in almost every surround system made are NOT the same as the front ones. They are designed for ambience and room sound and typically don't have the bandwidth needed for quad music. This is why the majority of Surround music title are live shows and the rear is for the audience and reverb. The speakers are typically smaller and they just don't sound the same. When you do a rotary pan through a typical surround system the quality of the sound changes when it goes through the center (usually optimized for movie vocal tracks) and the rear. It is really a shame that this is the typical way it is. There is no technical reason the rear speakers have to be different, they just are in every commercial surround system I have ever seen sold. I remember, and owned a quad system back when they first came out. There were format battles for the Quad LPs made at the time, but the playback speakers and amps were at least balanced. If playback is you only concern then surround encoding is the way to go. Almost every Surround encoder I know allows configuration the speakers so just choose 4.1 or 5.1 and don't use the center front (and maybe the sub) and you have quad. Many encoders in the higher range allow the simultaneous encoding in multiple formats with graphical placement of the sound being translated to the output format (5.1, 7.1 etc). Of course many of the home theaters systems will not have been upgraded to have matching speakers in back, but there is a higher chance that the audiophile listeners will have done that. I used to do that in my rig with Mackie HR series speakers all round but it was way too much for movie watching and the back pair ended up going into my studio and were replaced. I have gone 5.1 on everything I do, lot of options on playing it. Realistically the 5.1 normally only has something in the quad channels.